Growing up I was never a big fan of beetroot. I think this was due to the highly acidic pickled stuff you get in jars, which was pretty much the only type of beetroot available back then. My grandmother used it on all her salads and everything else on the plate would be tinted purple and tainted with its earthy, sour taste. However, in recent years as fresh, unpickled beetroot has become more readily available, I have become a convert. So when someone gave us a few freshly dug beetroots recently I was absolutely delighted and started thinking about what I’d cook with them. 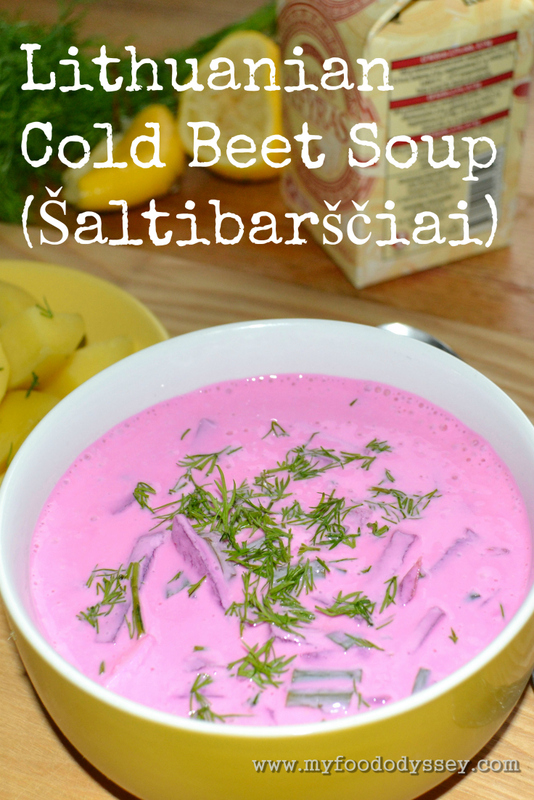 In Lithuania, there’s really only one thing to do with beetroot and that’s make cold borscht soup, known in Lithuania as šaltibarščiai (shalt-eh-barsh-chay). This garishly pink soup is incredible popular, particularly in summer when the weather can be quite hot. It is made using a cultured milk called kefir (kefyras in Lithuanian), which is like a cross between yoghurt and buttermilk. Because it is contains high quantities of beneficial bacteria and yeasts, kefir is very good for your digestive system. Couple that with the benefits of eating the “superfood” that is beetroot and you have a highly nutritious lunch! As this is a cold soup it is incredibly quick and easy to make. The only cooking required is for the beetroot. If cooking beetroot seems like too much trouble, or if you can’t source fresh, raw beetroot to cook, you can simply use the cooked beetroot that is now available vac-packed in the vegetable section of most supermarkets. The most difficult aspect of making this soup is probably sourcing the kefir milk. Unfortunately, while widely available in many countries, kefir is not available in all supermarkets. If it’s not available at your local supermarket you may find it at Lithuanian, Polish or Russia food stores. Alternatively you can make an approximation using yoghurt and buttermilk, both easily and cheaply available. Despite being a cold soup, borscht actually makes a fantastic autumn lunch. It has a mild taste but is quite hearty due to the amount of solid ingredients. It would make for a great light lunch on a day when you know you’ll be having a heavy or stodgy evening meal. Lithuanian šaltibarščiai is traditional served with a side of warm, boiled potatoes. However, you can replace these with a slice of rye bread or your favourite crusty loaf, as you prefer. In the original version of this recipe I used my own homemade pickles instead of fresh cucumbers as I liked the zing that they brought to the soup. Traditionally, fresh cucumbers would be used. Either will actually work well. In summer I tend to use fresh cucumbers, but off-season I still use pickles if I can’t find good quality fresh cucumbers. Traditionally, šaltibarščiai would not contain lemon juice. However, in an attempt to use less salt in my diet I like to use a small amount of lemon juice to provide a little piquancy. It should not be possible to taste the lemon juice – only to feel a slight bite from its acidity. You can leave the lemon out if you prefer, seasoning only with salt. Spring onions are not widely available in Lithuania. Lithuanians rarely pull young onions for use in salads. Instead, they cut some of the green stems from onions that are still growing and use only these stems in their salads. The stems regrow quite quickly, so you can cut them again and again until it comes time to lift the onions. We have a few onions in the garden and I used some of their stems in this dish.r stems in this dish. Peel the potatoes and chop into bite-sized pieces. Place in a saucepan of boiling water, add a good pinch of salt and boil until a knife can easily pierce the flesh. While the potatoes are boiling, assemble the soup. Slice the beetroot & gherkins into fine julienne. Chop the eggs into small dice. Chop the scallions or onions leaves into 1 cm (½ inch) pieces. Pour the kefir into a large bowl or saucepan and add the chopped ingredients and half of the lemon juice, holding back some of the dill for garnish. Taste and season salt and additional lemon juice as required. Ladle the soup into bowls and sprinkle with the remaining dill. Serve the potatoes on a side plate so that they do not heat the soup. You can now find all the Lithuanian recipes featured on this site in my new cookbook. This beautiful 77 page book also contains stunning photos of the Lithuanian countryside. Available from just $2.99 here. To preview the book click here. Hi! I hope you don’t mind if I link this post to a blog post I am writing about my husband and my trip to Lithuania, and our experience eating this dish. It does a great job of explaining the meal, and the recipe seems spot on! Hi Aftyn. By all means, do link to this blog post from your own blog. As long as you don’t reproduce any of my content directly on your site, that’s absolutely fine. June. I am an American born Lithuanian first generation, 65 yrs old, and we make the cold beet soup pretty much the same way you do but without the pickles, and with fresh cucumber, and we would use buttermilk and even sour cream, and would also add lemon or vinegar to add that tartness. Otherwise pretty much identical. Would make a huge pot of this that everyone would love, at least in our family, and boiled hot potatoes as a side. Kugelis was another huge favorite. As well as many of your other recipes. We learned Lithuanian first after we were born since our parents only spoke Lithuanian when they arrived in 1951. I think I am going to order your cookbook to send to my younger siblings. By the way, we also especially love Lithuanian beet salad which I would make with small white beans, chopped boiled potatoes, chopped pickles, chopped onion and lots of chopped beets, of course with chopped hard-boiled egg, mixed with sour cream and mayonnaise which is what we had available. It seems like everyone likes the addition of mayonnaise, even people that we know from Lithuania. We would call this salad vinagretta. I don’t know how you really spell it. Hi Maria. Thanks for your lovely comment. That saltibarsciai sounds delicious! It really is such a wonderful soup in summer. Vinegretas is still a very popular salad here. I think most people do use a dollop of mayo as well as sour cream. I hope your siblings enjoy the book. As well as the recipes there are lots of lovely photos of the Lithuanian countryside. Take care, June. Great tutorial but I’ve never seen a single Lithuanian using pickles in saltibarsciai. Everyone makes them with fresh cucumbers only. Might be a regional difference though. We have at least 4 distinctive regional cuisines in Lithuania. This dish as many others were a common in our household. When making my soup… I use some pork rib meat, sometimes ham rind, I also use the beet tops cut up as part of the green. Vinegar and then add sour cream to taste which makes it just right. Baltic rye with boiled potato. Kugula, Bacon Buns and cheese filled dumplings all from old traditional recipes. That sounds delicious! I recently froze all the beets from the garden and have been wondering what to make with them. I’m going to have to try this. It’s actually really good, Shelly, despite the colour. Light and refreshing, especially on a hot day. Definitely worth trying. Brings back memories of Babyte. My mom used fresh cucumbers — they give the soup the delicate freshness of summer, especially freshly picked.. I prefer English cukes seeded. (Not traditional, but have you ever oven roasted the beets? Flavor is deepened because the sugar gets concentrated instead of diluted when boiled.) Keeping the eggs on the side until service is a great idea because one can individualize the quantity. That would make it vegetarian. Another modification is using chive flowers pulled apart, although I suppose you could float the flowers for the aesthetics,and not eat it. Not that this gorgeous fuchsia colored bowlful needs help in that department. Thanks for spreading this recipe beyond Lithuania’s borders. Hi Lili. Now that I have a plentiful supply of fresh cucumbers in my greenhouse I do tend to use fresh cucumbers rather than pickles in my šaltibarščiai. Pickles are a great substitute off-season, though, and they add a nice zing to the soup. I haven’t tried roasted beets but I often use homemade beet kraut, which is grated beets fermented like cabbage in sauerkraut. (I’ll be posting my recipe for beet kraut on the blog soon.) It’s so handy to just spoon it straight from the jar. Eggs on the side is a good idea. I’m not mad about eggs in my soup but to Arūnas šaltibarščiai is just not complete without eggs. This is one of the best Cold soup to eat in the summer(or any time). My Mother always made this for our family. And I do the same for my family! I love it too, Danute. I recently had a tooth removed and couldn’t eat anything hot and it was just perfect – cool, tasty and comforting. I have eaten this wonderful soup since I was a little girl. Delish!!!! The colour is a little shocking to the uninitiated, but it really is tasty! I make a beautiful beetroot mouse. It looks like raspberry so it confuses the taste buds! Really nice. We grow beets and I look forward to using them in your recipe! Thanks Lux. Yeh, I’ve had it both with and without the egg. Maybe it’s a regional thing or maybe it’s just down to taste. Thanks a million for sharing on Twitter! I’ve never met a beet I didn’t like. Now Butler on the other hand can’t scrape them off his plate fast enough. This looks scrumptious. Thanks Susan! It’s an interesting soup. It looks very peculiar to the uninitiated but it really is great in hot weather. Worth a shot! Reblogged this on Man patinka Lietuva. One of my favorite soups. When I was young, kefir was not heard of, and I don’t think it was in pre-war Lithuania either. Mother made this with buttermilk and some sour cream to thicken it a bit. Never used pickles. If you are making more than you will eat right away, do not put the eggs in the bowl – add to individual servings, if using. I don’t normally use them at all. Thanks Liz! Hope you’re keeping well! This is definitely a good “cure”, Kev! You’ll be all fixed in no time! Thanks! The colour is a bit freakish, alright! I had a look at your site, Deena – some very tasty-looking recipes! That beetroot and masala potato recipe looks delish!